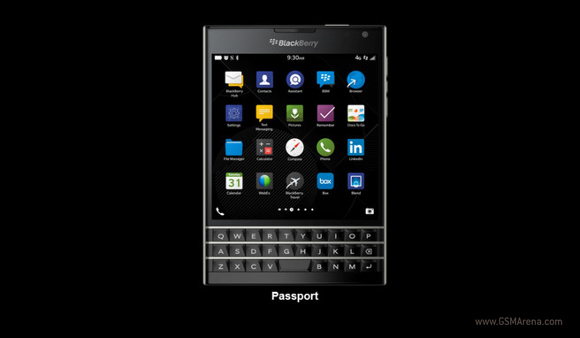 The technical specifications of the BlackBerry Passport got revealed in full detail. The hardware QWERTY smartphone is expected to launch at some point next month. BlackBerry Passport will pack a Qualcomm Snapdragon 800 chipset with 2.2GHz quad-core CPU, Adreno 330 GPU, and 3GB of LPDDR3 RAM. The handset has 32GB of memory on board, which can be further expanded via a microSD card slot. The device’s display is a 4.5” LCD unit with a 1:1 ratio and resolution of 1440 x 1440 pixels (453 dpi). Corning Gorilla Glass 3 covers the screen. A 13MP f/2.0 main camera with OIS and 1080p @ 60fps video capture is in charge of capturing memories. A 2MP fixed-focus front-facing unit with image and video stabilization will handle selfies and conference calls. Unsurprisingly, the BlackBerry Passport has a bevy of connectivity features. They include LTE, HSPA+, Wi-Fi a/b/g/n/ac, Bluetooth 4.0, GPS, GLONASS, and NFC. The handset will sport a nano-SIM card slot. Wired connectivity options include USB 2.0, USB 3.0, VGA, DisplayPort, and HDMI. The last three options will be available via a SlimPort adaptor. Measures of the BlackBerry Passport are 128 x 90.3 x 9.3mm (9.6mm at the camera unit), while its weight tips the scale at the substantial 194.4 grams. The device will tote a whopping 3,450mAh battery. BlackBerry Passport has already made a number of appearances. Recently, its innovative keyboard starred in a video demo.